Archibald B. Chapin was born in Ohio in June 1875, according to the 1900 U.S. Federal Census. In the 1880 census, Chapin was the only child of Charles Hamilton, a store clerk, and Ada Winifred. They resided in Mount Vernon, Ohio on Gay Street. “A.B. Chapin, being of sound mind and in possession of such faculties as are his to be blessed with, does hereby, at the request and order of his new boss, depose and testify,” wrote A.B. Chapin, a Journalism Week speaker, when he became cartoonist of the St. Louis Republic. “He was born in Ohio. He was led out of Ohio while a boy by his parents, who resolutely set their faces to the plains of Kansas. He has, for the past twenty-five years, fought, bled and died two or three times a week defending the honor of his adopted state. He never was an infant prodigy, nor were his papers in the drawing classes the ‘marvels of neatness,’ or the indications of ‘wonderful talent.’ No ‘I knew him when’ clubs have ever been started in his honor and probably never will. “He skinned through school somehow. He also went through high school. After he had surmounted the Alps of his high school days he became obsessed of the idea that it was his mission in life to break into the newspaper game. His start along that line was not accomplished by all the pyrotechnics of a flashing meteor. His desire to study art at this time was blocked by an embarrassing lack of funds, so he drove a fish wagon long enough to hoard up car fare to New York and buy a few ‘sinkers and coffee’ and there he stayed during 1899–1900. According to the 1905 Kansas State Census, Chapin’s wife was Lydia and they had a son, John, age 3. In 1910, Chapin remained in Kansas City but at a different address, 2406 North 10th. He had two daughters, Elizabeth and Barbara. Not listed was John whose fate is unknown. Chapin and Lydia had been married for nine years. His father's death was mentioned in Cartoons Magazine, October 1915. For the St. Louis Republic, Chapin produced Home, Sweet Home from 1917 to 1919. St. Louis, April 11 — A.B. Chapin, one of the best known cartoonists in the middle West, has resigned from the St. Louis Star, effective May l, when he will go to Philadelphia to become cartoonist for the Country Gentleman. Chapin has been a cartoonist on Missouri newspapers for more than twenty years. He came to the Star from the Republic, when that paper suspended publication in December, 1919. He had been with the Republic seven years. Previously he had been with the Kansas City Star. Chapin has been drawing cartoons for the Curtis publication for more than a year. His best known series here has been “Breaking into the Big League.” The Star has made no definite selection of a successor to Chapin. 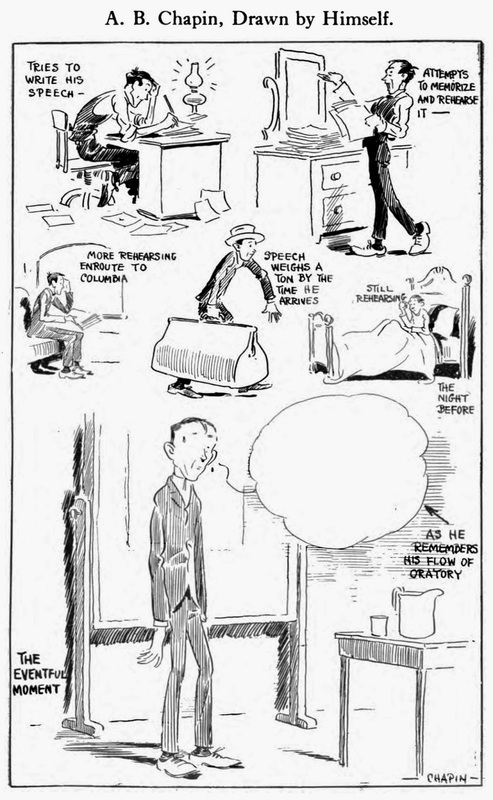 According to American Newspaper Comics (2012) Chapin produced Uncle Dudley (1922), Chapin’s Daily Comic Strip (1922; replaced Uncle Dudley) and A.B. Chapin Cartoons (1925–1927) for the Ledger Syndicate. His longest running work, from the mid-1920s to early 1930s, was the panel, Superstitious Sue, for the McClure Syndicate. Chapin’s home in the 1930 and 1940 censuses was Swarthmore, Pennsylvania at 217 Harvard Avenue. He was a newspaper cartoonist. In 1942, he moved to Schenectady, New York, and drew a weekly cartoon for the National Weekly Newspaper Service. The Kansas City Star (Missouri), January 10, 1958, published a letter from Chapin who recalled his time at the Star. New Hartford — A. B. Chapin, 87, of 15 South Hills Drive, a political cartoonist, died today in his home after a long illness. He began his career on the Kansas City Times in 1900, and in 1902, joined the Kansas City Star, where he was the political cartoonist until 1913. Later, until 1922 [sic], he was with the St. Louis Republic and St. Louis Star. 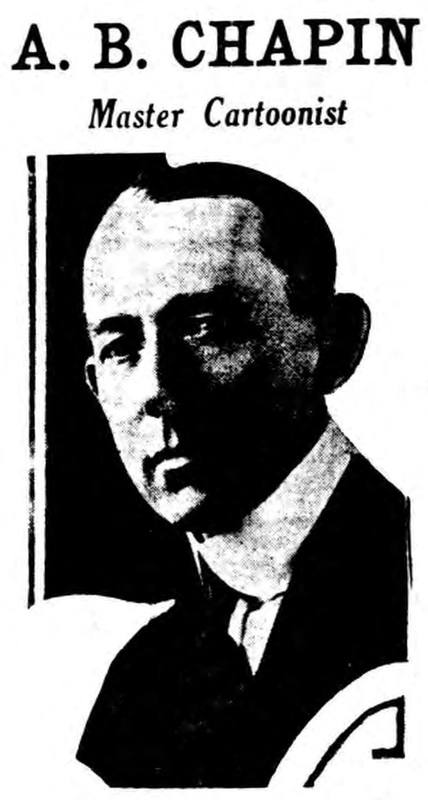 He moved to Philadelphia in 1922 [sic], and became associated with the Country Gentleman Magazine and the Philadelphia Morning Ledger until 1942. He then moved to Schenectady, where he continued to draw a weekly cartoon for the National Weekly News Service until retiring in August of this year. He leaves his wife, the former Lydia Emily Hale; two daughters, Mrs. Richard D. Hickox, with whom he lived, and Mrs. Harvey F. Mett, both of New Hartford. The funeral will be at 2 tomorrow from St. Stephen’s Episcopal Church, with the Rev. William B. Schmidgall, rector, officiating. Burial arrangements are incomplete. A. B. Chapin was my surrogate grandfather ie, his son-in law was my father's twin brother. He was a unique man, in his early 80s putting a new roof on his summer camp (he named Crummydump) on Lake Galway in upstate NY, as well as jacking it up and pouring a new foundation for the cottage. He could make anyone he talked to feel that they were the most interesting people he had ever met. He had posted a sign he created on the landing of the stairs leading to the second floor of the cottate that read, "All ye who enter here leave modesty behind". Hello, I am a researcher at the University of Michigan. I am searching for any available copyright information about Chapin's works, specifically about a cartoon that appeared in the (now defunct) Philadelphia Ledger on May 3, 1927. I have not found any such information in any other channels, and was hoping either Mr. Holtz or his readers may know something about securing such a permission. I welcome any kind of information or leads. Thanks!